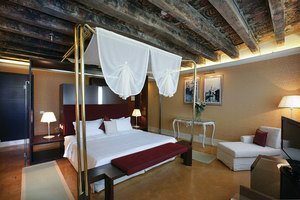 The 4* Hotel Palazzo Giovanelli is located on the Grand Canal in the historic centre of Venice. The building is absolutely charming with wooden beams and high ceilings. 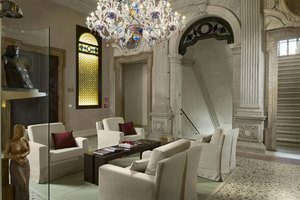 The hotel combines both modern comforts with the opulent traditional Venetian style. Only two stops by water bus from the iconic Rialto Market, this stunning palace gives you the proximity to the main sights of the Serenissima whilst being hidden from the bustle of tourists. The water bus stop is just a two minute walk from the hotel, which is ideal to explore the enchanting city of Venice. The multilingual staff are friendly and welcoming, always happy to help and answer any questions you may have. 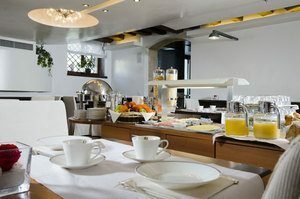 The hotel has a lovely breakfast room, where fresh local specialties are served every morning alongside the famous Italian caffè. There is a cosy bar to relax after a long day and enjoy a drink before or after dinner. In addition the hotel has its own water door. The elegant and quiet rooms are decorated with contemporary furniture designed to fit perfectly with the period features of the hotel. The marble bathrooms are gorgeous. Complimentary toiletries, bathrobes and sleepers are at guests’ disposal in each room. Room grades include Superior, Deluxe and Junior Suites. Each room has a garden or a canal view.